The program begins with a group orientation that you will attend without your dog. All adult family members (and responsible teens) are welcome. Orientation is offered from 2:30 pm until 5:30 pm (when scheduled on a Sunday) and from 6:00 pm to 9:00 pm (when scheduled on a Monday). At the orientation you will learn about equipment, management, training and more for leash lunging dogs. You’ll watch part of a class in progress. You’ll gain access to online materials including an overview of the program, a training plan, instructions for what you need to do during the week to prepare for the next step. The next step is a private session. 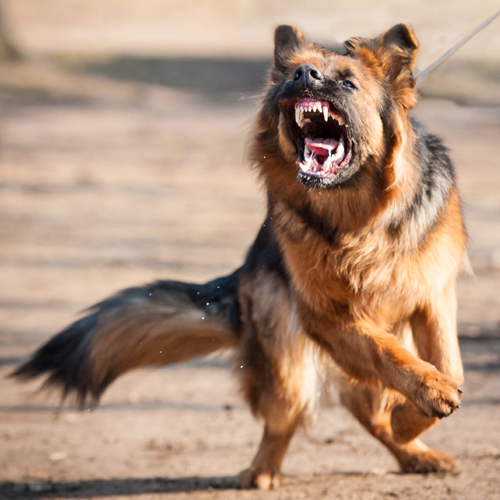 Handling a dog that is likely to pull, bark, and lunge without careful, skillful, management is a challenge. 45 minutes with you, your dog, a trainer focused solely on coaching you jump-starts your progress and helps prepare you and your dog for class. After your private session, you and your dog are ready for group class. In the group sessions you will learn to help your dog relax and respond to you even when other dogs are in sight. Your dog will learn and practice a new behavior that is incompatible with lunging at other dogs. In the process, he will start to feel more comfortable being around his triggers. The program thus focuses on two aspects of your dog’s reaction on leash: what he does and how he feels. Group sessions are 1 hour long. Several group session times are scheduled for each week, between 3:00 pm and 7:30 pm on Sundays and between 5:00 pm and 9:00 pm on Mondays. The schedule varies slightly dependent on Client preferences and number of classes needed each week. All dogs progress at their own pace. Our classroom sessions give you and your dog hours of focused practice with your new skills in the controlled presence of other dogs. After your six classroom sessions you can elect to take more Level I group classes ($100 for each set of three additional classes) or, if you are ready, you can graduate to one of the specialty classes available for recovering leash reactive dogs.